The minutes of the June Meeting were read by Cynthia Shaver. As there were no corrections, a motion was made to accept the minutes as read. It was seconded and approved. account is $5324.93. The club sold shirts at the Summer Show. The amount received from the sale was $1220.00. $940.00 went to the supplier and the club received $280.00. There was no expense incurred by the club. $1000.00 was sent to the IHC Charitable Trust for the McCormick Farm. The proceeds from the auction was $3282.00. As there were no corrections, a motion was made to accept the report as given. It was seconded and approved. The club received a $150.00 donation from the Grottoes Fire Department. This donation was given to the club because our “Pedal Pull Team” helped with a Pedal Pull function for the Fire Department. Summer Show Report: There were 175 exhibits at our Show. 1. Close the building at 6:00 P.M.
2. 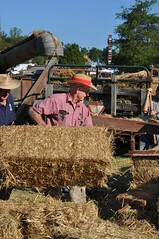 Have a Show Chairman with all committees reporting to the Chairman. area where it was this year. 4. Possibly having tours to the McCormick Farm on Friday and Saturday. The camping for the Show will be $35.00 per night. The club will be responsible for collecting the fees. ALL CAMPING will be in the lower area of the Fairgrounds near the cattle barns. It was recommended that we get our shirts from the same supplier we used for this year. 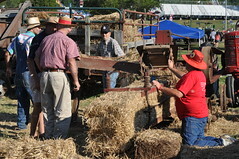 October 7th is Mill Day at the McCormick Farm. 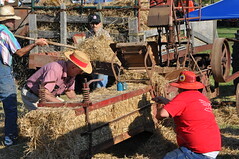 On September 24th there will be a session about the McCormick Farm Training Tours. Tinker will let everyone know about the time. On August 21st there will be a Pedal Pull at the Page Valley Fair. Registration is at 7:00 P.M.,Pull at 7:30. There was discussion about getting shirts for the “Pedal Pull Team” to wear when they do Pedal Pulls at other functions. A motion was made to get the shirts. It was seconded and approved. There will be no Fall Harvest Day in Timberville as scheduled for October 14th. Due to lack of rain in the area the corn that was planted for this event will not be ready. Somerset Steam and Gas: does the club still want the spot for next year? It has to be taken care of this year. A motion was made to keep the same location. It was seconded and approved. Winona thanked everyone for their donations and participation in the Auction. She said she would like someone else to take over as Chairman for the Auction. Please think about volunteering for this. Winona has done a wonderful job as Chairman of the Auction Committee. Winona thanked everyone for sending birthday cards to Cotton.